I created a video that explains the situation. This blog post goes into more detail and has some code examples. But check out the video to get a quick overview. A type mismatch happens when you expect an input parameter or a return type of a function to be a certain type, whereas in reality you get a different type. PHP offers type hints to indicate what type an input parameter should have. Let’s say you want your function to accept an integer as an input parameter and you pass a string, there’s a possibility that a TypeError is thrown. I mentioned that a TypeError can be thrown be PHP, just like exceptions. 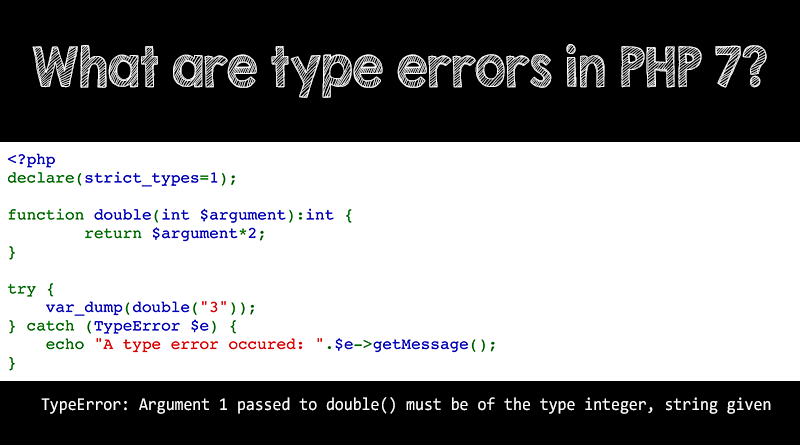 Just so you know: TypeErrors inherit from the general purpose Error class. When are type errors thrown? Under all other circumstances, nothing much will happen and the script execution will continue. What is strict types all about? You noticed that I mentioned the term strict types. That’s actually a setting you can enable and disable in PHP. By default, PHP is loosely typed and the PHP core development team wants to keep it that way. Historically, PHP has achieved its status and its popularity by being loosely typed. This lowered the barrier for people to come in and use PHP as their scripting/development language. As the community and the language became more mature, the need to have strict types emerged. In order not to conflict with the desire to still have a loosely typed language, a new setting was introduced: strict_types. By default it’s turned off, but you can enable and disable it explicitly. When enabled, every type error, even the ones the can be ignored due to type coercion, will the thrown. The same deal applies to return types: PHP will try to convert the returned argument to the type that was hinted. Scalar types can usually be coerced. As mentioned in the previous section: scalar types can easily be interchanged and often don’t cause type errors to be thrown on type mismatches. When a coercion fails, a type error is thrown.